We just had a banner weekend. On Saturday we took 8 teams to the RI Middle School Cross Country State Championships. Roughly 1/5th of the teams at the championship meet were coached by NE Distance athletes. This included seven Providence public schools that had not been to the State Championships in, well nobody really knows how long it has been. Woonsocket, of course, represented well as well and showed Providence what 3 years of hard work can turn into. It was some real cross country weather and we managed to get the kids back on the bus just as the sky opened up and the rain started pouring down. On Sunday, the skies cleared up, but some blustery wind blew through. 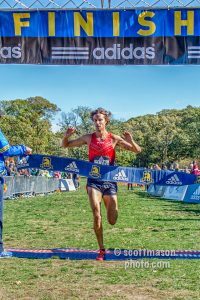 This did not stop Jim Spisak from opening up a lead early and winning the individual Men’s title at the BAA Mayor’s Cup in Franklin Field, Boston in a dominant fashion. The rest of the NE Distance crew represented well as they took the team title with 19 points. Congrats to Jim, Henry, Jake, Julian, Nick, Katrina, Ryan and Steve on a great weekend. Read about it in Race Results Weekly and the Providence Journal.